Indian mobile operators added 5.3 million subscribers in August, the lowest since May 2007. What’s more, the month-on-month growth rate of subscriber addition fell below 1% for the first time, if one were to exclude the aberrations in mid-1998 and mid-1999, when operators were weeding out inactive customers from their reported list of subscribers. The numbers pertain to mobile subscribers on the GSM (Global System for Mobile Communications) platform, and exclude those of Reliance Communications Ltd and Tata DoCoMo, which haven’t yet reported their numbers. 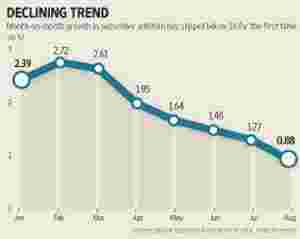 As the chart shows, the drop in subscriber addition has been quite sharp, falling from a high of 17.2 million subscribers last November to 9.5 million this May and further down to 5.3 million in August. Last month’s subscriber addition tally was as much as 30% lower compared with July. Interestingly, share prices of leading GSM firms Bharti Airtel Ltd and Idea Cellular Ltd didn’t budge, despite the sharp drop in growth numbers. The total wireless subscriber base (subscriber identity module, or SIM cards, actually) has risen to 858 million, according to the data collated by the Telecom Regulatory Authority of India for July. About 602 million of these were active subscriptions, giving a tele-density of around 50%. In the mainstay urban market, tele-density is much higher. Growth from these levels will evidently be challenging. Besides, in the past few months, wireless operators have gone slow on freebies and discounts to attract customers. Till early this year, there was a lot of irrational pricing in the market, which now seems to be coming to an end. Some telecom firms have even gone ahead and increased tariffs in some circles. According to analysts, the cumulative benefit of lower discounts and higher tariffs will far outweigh the impact of lower volume growth. In any case, the wireless telecom story has now changed. From being merely a subscriber growth-led model, telecom companies’ growth and profit now largely depends on the growth in usage of data services and their ability to increase tariffs. As such, the negative surprise on the subscriber growth numbers isn’t expected to affect valuations of telecom stocks.